Drew Fisher of Ottoville wins the header against Spencerville’s Seth Clark on Monday evening at Ottoville. Ottoville’s Carson Stoner attempts to shoot on goal but is stopped by Spencerville’s Jacob Litsey as goalie Dominic Adkins comes in for the ball on Monday evening at Ottoville. 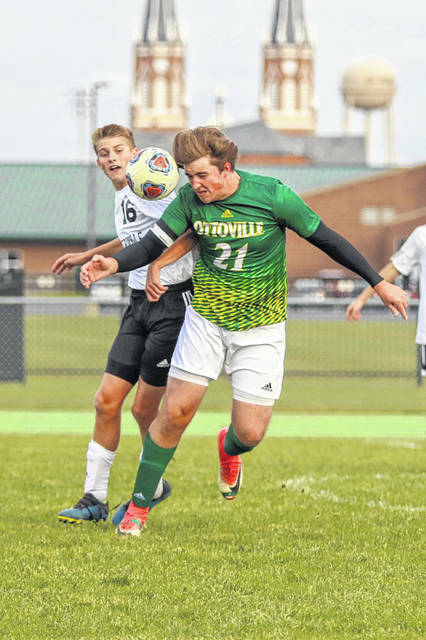 OTTOVILLE – Ottoville scored two second half goals to down Spencerville 3-1 in the Division III Sectional opener on a chilly and windy weather Monday. After the visiting Bearcats tied the score at the 16:59 mark of the second half, the host Big Green scored the next two goals to grab a 3-1 victory. The Big Green (11-2-3) will tangle with the winner of Fort Jennings and Continental in the next round. Spencerville head coach Josh Van Gorder was pleased with his team’s efforts. Ottoville took a 1-0 lead after the first half and had a pair of chances to go up by two goals early in the second half. At 32:01, Nolan German misfired from in close and just over a minute later, his shot from the right wing was denied by Spencerville goalkeeper Dominic Adkins (7 saves versus 10 shots on-goal). The Bearcats (2-12-1) got the equalizer at the 16:59 mark on a penalty kick after the Big Green was called for a tackle in the box, with Zach Ringwald going hard right for the goal and a 1-1 scoreboard. It took the Big Green just over three minutes – at 12:33 – to get the eventual match-winner. On a cross pass from the left side to the middle, German found Dalton Davis in front and he found home from 10 yards for a 2-1 edge. At 4:38 of the second half, on a throw-in from the left side – outside the 18-yard box – German got control on the left wing and fired a curler from 19 yards that got inside the left post for a 2-1 edge. At 4:38, on a throw-in from the left side – outside the 18-yard box –German got control on the left wing and fired a curler from 19 yards that got inside the left post for a 3-1 edge. Neither team could put together many goal-scoring opportunities for the first 15 minutes of the matchup. Spencerville had the first chance at 23:20 as Evan Core fired a 20-yarder that hit off a defender and goalkeeper Kaiden Trentman (3 saves versus 4 shots on-goal) gobbled it up. At 11:22, Ringwald fired a 30-yarder free kick that was turned away by Trentman. German had the first shot on-goal by Ottoville at 10:40 when his 16-yarder was denied by Adkins. The Big Green went up 1-0 at the 8:42 mark of the opening half as Davis got an opening from the right wing and his 19-yarder hit off the left post and ricocheted into the goal. Adkins stopped two more Big Green tries is in the first half at 7:40, denying Joe Miller from 22 yards; and at 6:20, deflecting Collin Knotts from 15 yards. In the second half, Ottoville had three chances to try and go up by two goals: at 32:01, when German was over the top from in front; at 31:04, when his 15-yarder from the right wing was denied by Adkins; and at 15:10, when Will Miller was stopped by Adkins from 18 yards on the right wing. Spencerville had a chance to tie it at 29:40 when Seth Clark’s 16-yarder was turned aside by Trentman. https://www.limaohio.com/wp-content/uploads/sites/54/2018/10/web1_Ottoville-vs-Spencerville-Boys-Soccer-2-2-1.jpgDrew Fisher of Ottoville wins the header against Spencerville’s Seth Clark on Monday evening at Ottoville. 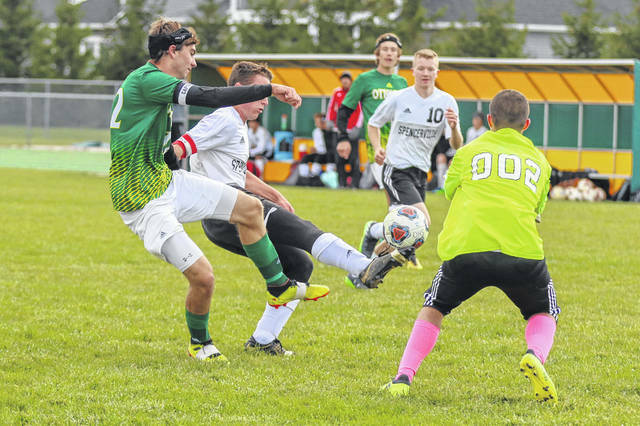 https://www.limaohio.com/wp-content/uploads/sites/54/2018/10/web1_Ottoville-vs-Spencerville-Boys-Soccer-2583-1.jpgOttoville’s Carson Stoner attempts to shoot on goal but is stopped by Spencerville’s Jacob Litsey as goalie Dominic Adkins comes in for the ball on Monday evening at Ottoville. This entry was tagged ottoville, Spencerville. Bookmark the permalink.